Aruncus dioicus (Goat's Beard) | Plants of the Northeastern U.S.
PA to OH, IN, and IA, south to NC, AL, and AR. Herbaceous perennial; stems erect, 1-2 m; leaves alternate, 2-3-ternately compound, to 50 cm; leaflets lance-ovate or ovate-oblong to broadly ovate, 5-15 cm, acuminate, doubly serrate, rounded to cordate at the base, the lateral ones usually oblique, sometimes 2-lobed; inflorescence 10-30 cm; petals white, about 1 mm or less; fruit reflexed, 2 mm, with persistent style. Makes an excellent garden plant for shaded or partly shaded locations, though its size makes it best for the middle or back of the border. 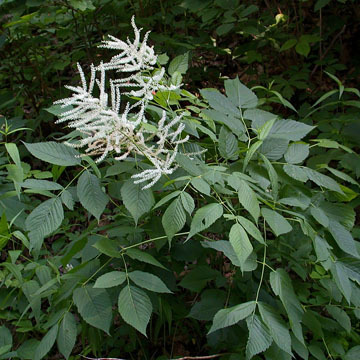 Similar in appearance to Astilbe spp.